Yeah, I’m one of those. I love turkey bacon. Don’t @ me. 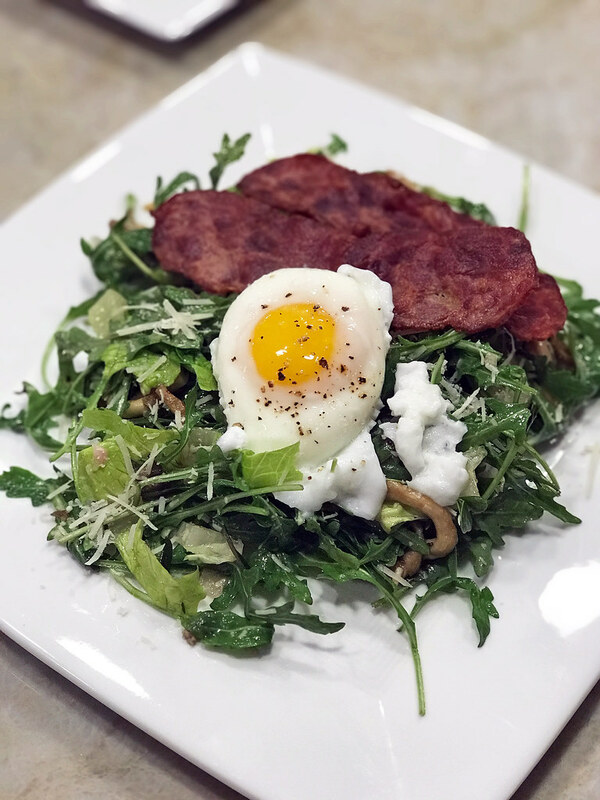 In this salad-as-a-meal, mixed greens, wild mushrooms, bacon, and a poached egg come together to form a greater than the sum of its parts dish. I used a blend of romaine and baby arugula here, but feel free to use anything. And you can fry your egg instead of poaching it, too. Just give the turkey bacon a chance. 1. Place half of the Parmesan in a large bowl and add shallot, vinegar, honey, and 4 teaspoons oil and whisk; season dressing with salt and pepper. 2. Cook bacon in a large skillet over medium-high heat, turning occasionally, until brown and beginning to crisp, about 6 minutes. Add rosemary and cook, turning once, until crisp, about 2 minutes. Transfer bacon and rosemary to paper towels. 3. Add remaining teaspoons oil to skillet and heat over medium-high. Arrange mushrooms in pan in a single layer and cook, undisturbed, until golden brown underneath, about 4 minutes. Season with salt and pepper and continue to cook, tossing, until golden brown all over, about 5 minutes. Transfer to bowl with dressing. Strip rosemary leaves off stems into bowl and add lettuces; toss to combine. 4. Meanwhile, bring a large pot of water to a boil. Reduce heat so water is at a simmer. Crack an egg into a small bowl; gently slide egg into water. Quickly repeat with remaining eggs. Poach, rotating eggs gently with a large slotted spoon, until whites are set but yolks are runny, about 3 minutes. Using spoon, transfer eggs to a plate. Season with salt and pepper. 5. Arrange salad on 4 serving plates, sprinkle remaining Parmesan over and top with bacon and poached eggs.